A discussion with the filmmaker whose poignant imagery blew me away at this year’s Redstone Film Festival. 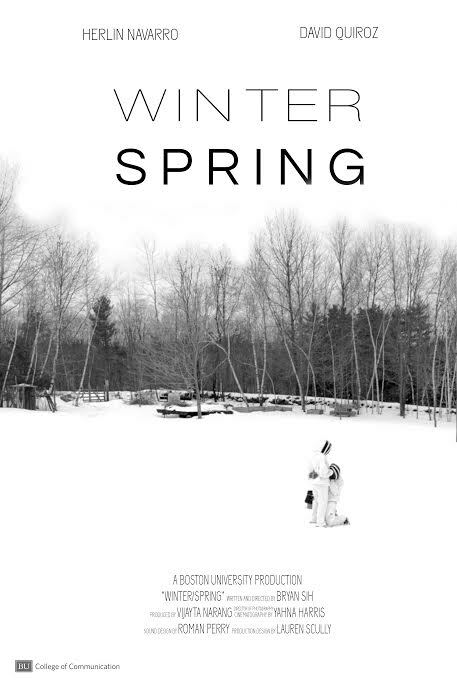 From its very first attention-grabbing shot (of two beekeepers, trudging through a wintry snowscape in full bee-repellent regalia), Bryan Sih’s Winter/Spring had me spellbound. The imagery alone warrants high praise, and the accompanying story doesn’t disappoint. As I watched the film unfold, I realized I was seeing the rare short that is both personal and universal. Every other scene brought to mind a deeply private experience, yet seemed to speak to everyone in the room in the same breath. What’s more, it’s a beautifully-rendered piece, blissfully lacking the clutter and clunk of excess dialogue that is so common in student work. Unable to get Winter/Spring out of my mind, I reached out to Bryan himself in hopes he’d be willing to talk more. Thankfully, he was. The ensuing conversation turned out to be one of my favorite interviews–it’s thrilling when you get to talk to someone who truly gives back as much (even more) than what you’ve put into the questions. I hope everyone enjoys our exchange as much as I did! In your online fundraising campaign, you write about how Winter/Spring has it’s roots in Sherwood Anderson’s short story, “The Untold Lie.” Can you talk more about your reaction to Anderson’s piece, and how it led you to write this short? I started thinking of parenthood after reading Sherwood Anderson’s The Untold Lie freshman year. That short story sparked my questioning about bringing a child into the world where the adults are just as confused as the child will be—Anderson had this vision where we stand bewildered at the world, at ourselves, and our circumstances, so it’s absolutely crazy bringing a child into all of this, and at the same time, necessary and brave. At the end of the story, the protagonist arrives at this aforementioned contradiction or paradox, and I think art is especially disposed to exploring anything paradoxical because art can transcend logic and achieve something poetic, where paradoxes seem to reside. Speaking of your fundraising campaign, it’s impressive. Any advice for those looking to fundraise for films (or other creative ventures) through crowdsourcing? I wasn’t very good at fundraising, to be perfectly honest, so I don’t know how much advice I can offer but I’d say really focus in on making a kickstarter video that will be informative, and let’s the potential donor that it’s a serious effort. We weren’t as creative as we could’ve been, but it was important to shoot the video on the location of the farm so the audience could get a sense of the space. One of the things I love most about your film is that it isn’t overwritten. This is something I have to fight against (hard) when screenwriting–do you find the same to be true? Or are you blessed with a style that’s naturally more succinct? I am a terrible screenwriter. Recently, I came across old drafts of Winter/Spring and it was terribly overwritten– it had voiceover and a lot of cliche spring imagery. Bless my friends, who all had enough faith in me to say, “yeah, something good is there” after reading it. The other thing I try to do is an exercise my friend Navzad taught me I called “translating” a screenplay. Basically, it entails writing dialogue heavily and getting your point across. Then you translate all the words into gestures, actions, blocking, aka the things that actors can really work with. Actors ask for lines but really what they need is behavior–something to do that is emotionally meaningful and appropriate for the scene. The imagery in Winter/Spring is incredibly poignant–I particularly loved the scenes where the couple shared the oranges. Where did you get the idea for those moments, and also that killer opening shot? The dirty truth is that my producer and I were coming to a realization that the initial cut wasn’t working, and we were missing something key for the story to work. I told her we needed to rewrite and re-shoot, and this alarmed us both, so that afternoon we got a six pack of beers and sat outside on her porch and just started shooting around ideas as to how we were going to fix the film. I think she had a fruit in her hand, and we started talking about showing their relationship dynamics/economics through the orange. We got really giddy talking about oranges for thirty minutes. Then we went to Trader Joes and chose the right sized ones, and that was that. I have to thank my producer Vijayta for this day– it was a huge leap in the story process. I think the oranges were mostly her idea too. The opening shot was more of a thought process I had. We were on the farm doing the kickstarter video (before principle photography) and it was covered in snow, and my whole crew was telling me it wasn’t going to melt in time for the actual shoot. One of the key images for the film was the couple in the green field with their bee suits on. I was devastated because the white bee suits wouldn’t show up against the white field, but in the next instant, I realized it was the perfect image to open a film about childhood and the potential for new life. I need a DP who can be responsive in capturing the unexpected moments where the actor does something unexpected. Unsurprisingly, these are usually the best moments of any film, but many filmmakers restrict their actors in the name of visual control. They want stiff, clean visuals, but then what they get is stiff, clean acting. I agree with you, but have also seen work I enjoyed where movement was tightly controlled (I’m thinking most prominently of Wes Anderson’s films, particularly the more recent ones). I’m curious whether you’ve read this critique of Anderson’s work, and how you view him as a director. The article you included works under the assumption that Anderson’s actors need to be expressive and free to move for them to be “naturalistic” and have “delightfully three-dimensional” performances. This preference for naturalism is a very American mindset when evaluating films, especially when the term “naturalism” is never defined sufficiently in advance (We can see this preference culminate with Birdman winning an Oscar in 2015). I think other directors have acting that is as stiff as Anderson’s, if not stiffer (yet perhaps their ends were still different, so can they be compared?). I’m not sure if I am as in awe as Anderson as I am of people that “did it before him”– those directors who have “out-Wes’sed” Wes Anderson’s stylistic quirks but have little traction in the American mainstream– like Ozu, Bresson, Chantal Akerman, or Carlos Reygadas. Bresson, for example, intentionally worked to reduce any performative elements in his films because he was trying to express ideas about incommunicability and the privacy of one’s soul. The style contributes to the meaning– not every filmmaker rushes headlong at “naturalism” for the sake of naturalism when it actually will digress from certain meaning-making potentials in film. I am not positive what the ends are to his style, so I hesitate to venture a guess, but if I must, I conjecture that Anderson is exploring how our identity is bound up in various “roles” (job, family position) and the world we find ourselves in, causing a certain, unnatural stiffness–small digressions can be made from this role, and the set pieces and costume echo a character’s stuck-ness in a world that reinforces pre-given identity. Another way to think of it: human life and human interaction are not as still and unobtrusive as the material things we surround ourselves by that supposedly inform who we are. Therefore, his sets must stand in stark contrast to his oft-labeled “dysfunctional” characters. As beautiful as it is in execution, I imagine this film was a rather ugly one to shoot. How was it for you and your crew to work in the cold, with the bees, etc? Were there any problems you didn’t foresee? The crew was miserable, tired, and freezing. The only plus side was that they were well fed and morale was high for the first few nights, albeit late, frigid ones. One of my crew members was designated as “Maria’s Assistant” and she would wrap Herlin (our actor) in a blanket or take her inside after various takes. Herlin was also truly terrified of the bees, and so the reaction you see in the film is actually genuine fear. She hated doing those takes, and I would stand off camera and laugh and laugh at her. She hated me in those moments undoubtedly, and we had to do it twice, because the first time we didn’t get it right. The other problem was the sheep. During the first take, one of the sheep decided to pee in front of the camera, and it all became comical very fast. You would never put a [Jackson] Pollock up against a [Mark] Rothko. You would just exhibit both in a museum. I’m just saying that most art isn’t subject to competition. You go to a music festival and listen to your favorite bands, but no band wins. That would be ridiculous, because we just want to camp out and enjoy the music. So why can’t film be like that? Why indeed–why do you think it is that we feel the need to rank films, whereas we don’t tend to rank festival music or museum art? The mistake in my thinking is that film is an art through and through, but it is actually the most confused medium that exists– film still hasn’t found a way to distinguish which parts of it are art and which parts are entertainment, even within a given film. The other mistake in my thinking occurs when I say that other art forms don’t compete. This is a false premise. There are music awards and even competitions for young classical composers; there are awards, residencies, and grants given to all artists, and you have to compete for these things. It may be better just to wonder what function competition serves–there is a deep need for hierarchy, to sort through a group of people trying to do the same thing and claim one way to be the best way. And sure, it starts debates over who should’ve won, gets everyone riled up and needlessly excited, it creates artist sponsorship and support systems, and gives an event an easy “angle:” “who will win? Come find out.” I also think competition is rooted in a deep need for ceremony, to select certain works and honor them year-to-year. Ideally, I would appreciate a festival that honored its selected work by fostering conversations about it, not creating hierarchies within a collection of disparate films. Competition is also a way to canonize art, to establish criteria for judging what constitutes the “good” in this nebulous field. Therefore, those in charge of the competition establish values about film that may or may not be relevant, but that will continue to be perpetuated as long as the competition claims to discover and award the “best” talent of that medium and people believe it. The final truth lurking under this film festival culture is that we all walk away with our own opinions regardless of the winner, and so ultimately there is never any real artistic validation to come out of an “artistic” competition even though there is that illusion–so we temporarily forget the simple thing we know: different art will move different people. And don’t even get me started about quantity– every small town now has a “film festival,” and the sheer saturation of festival culture has made most awards meaningless. I don’t say all this to be ungrateful towards the Redstones and criticize it; I’m just trying to understand what festivals really are, so I can feel grateful in the right ways, like grateful for the opportunity to screen my film next to other hard-working, talented filmmakers. The film is dedicated to your parents. Have they seen it? Something my mom mentioned after seeing Winter/Spring was that she was a little thrown by the action during the credits–it isn’t the black screen behind text we’re used to seeing, and it strikes a very different tone than the opening moments do. Was there much of a conscious decision behind that? And it was totally not child-proof, which made it all the more disturbing that Florencio would build something so dangerous for his child. So I later had to cut it from the film, but my mom insisted I leave it in, because my friend had spent so much time working on it. So the credits were the only place I could fit it in without calling too much attention to it narratively–a terrible yet hilarious reason. After the take you see, I ran and jumped into that crib, and sure enough, the bottom came out and I got stuck in it. As a soon-to-be (correct me if I’m wrong) graduate of BU’s film program, what’s your opinion on going to school to study film today? Do you think it’s worth the investment as a writer or director? It’s still a pressing, relevant question for me because I’m teaching film to high schoolers at an after-school-non-profit-art-therapy program called Raw Artworks these days, and some of the seniors looking to get into film school. This is a really tough issue in this particular context, because there are financial situations that will have people paying loans off for years. I really hesitate condoning film as an undergraduate study, because it’s a trade that won’t pay itself back right away and you often need a masters to be competitive for the jobs, or have a tenacity that is remarkable. It is not for the faint of heart, aka those who need stability in their job and pay. It isn’t glamorous either. But if you love it, you have to do it, and I can’t tell anyone what to love. I think for the seniors I work with, I want them to love something for the right reasons, and not the obvious “false” ones, so you try to feel them out for why they’re in it and what they perceive it looks like in the real world and amend that perception if necessary– do they think Hollywood is the only paradigm? Do they think they’ll start directing their first feature out of college? As a teenager, it’s really hard to know why you love what you do– I loved film because it was a fun thing to do with friends. I got into it haphazardly, then. I really didn’t know anything about film nor myself at that point (still don’t), so how was I to make that really expensive decision responsibly? Honestly, sometimes I seriously regret it and I don’t want someone else to make that mistake. After seeing this short, I’d love to see a full-length screenplay you’ve done. Do you find it’s harder to write shorts or full scripts? Is there one of the two you prefer? Well, I can’t write a screenplay I might hypothetically sell. That gives me no motivation, and I’ll stop writing it after the first 30 pages. I write stuff only to make it. That meant shorts in the past due to time and resources, but now I’m diving into a feature, and it’s thrilling. Features may be easier for me because I think in terms of fragments, and I like to develop things slowly over time. Shorts have me being too economic–a good challenge, sure–but sometimes I feel like I can’t explore things sufficiently. I would want to just riff on a question for 2 hours if the question was compelling enough. Something I enjoyed at the Redstones is the high degree of support you and the other filmmakers appeared to give one another. I’ve asked this question on our blog before, and am curious to hear your perspective: how important is it for you to work in and live in the company of other artists? Are you more of a solo cabin in the woods or bohemian collective type? Recently, I visited New York and went to a networking event, and I felt bewildered because everyone felt so distant and professional, and you just end up talking about your professional roles and career paths. This is a nightmare for me. When I sit down with my collaborators here in Boston, we talk about each other’s lives, what matters to us; we talk about film aesthetics and methods. We dream up future projects and review our mistakes on old ones. That, to me, is an ideal community, because we are talking about film-as-film, not film-as-a-profession. You need both sides of film, undoubtedly, but community to me is to be inspirational and supportive, not just a professional network. I am invested in the art part of it, so that’s what I want to be exploring with people, not career opportunities. As for solo vs. bohemian, it oscillates. At the beginning, I am the solo cabin-type. It is a painful time of sitting around in my room, writing images and scene ideas on a large sheet of paper, writing plot points in a journal, researching material, watching films as reference points, reading books for even more material, etc. I’ll get pretty depressed and lethargic. To cheer myself up, I’ll get some potential actors together and we’ll try out certain scenes. We’ll experiment, and I’ll just watch a dynamic play out for a while. This gives me a ton of new ideas and direction, so then I go back and write more given what I’ve seen work. I consult with friends along the way because I’ll edit myself as I tell them about the film, and those self-imposed edits clue me off to the script’s problems. When I feel like I’ve done my work and can come to the table with a sense of direction for the film, I bring everyone else in and it becomes very collaborative from thereon out. I have a theory that it’s easier to make film when there’s a singular vision driving the piece. Would you agree? On a personal level, do you find you prefer wearing more hats at once, or would you rather collaborate? This is a great question. Even if a director has a singular vision, the key factor is its interpretation amongst his or her collaborators. There are huge chasms to fill with personal interpretation between the words and plans given by a director to her/his cast and crew. I may say to my costume designer, “I want these colors and these fabrics” but who knows what she’ll pick out when she gets to Goodwill? It’s easier when the director has a clear, articulate vision to help guide and organize the creative process, but a director is only as good as his or her crew’s ability to critically grasp the ideas the director has in mind. On a personal level, I like both private and collaborative types of filmmaking. One of the most relaxing, rewarding experiences I find is making a film alone. I love setting up the shot on the tripod, pressing record, running into frame to act, and then taking a microphone afterwards and recording little sounds. I love having complete control and not needing to answer to anyone. It’s also a different discipline, not having the ability for the camera to move or change focus points, nor to use dialogue (unless you’re talking to yourself). You have to be extremely precise. But the other experience is just as rewarding, just in a different way. I love filling a set with people and running around like a madman trying to figure a scene out. I love the spirit of that filmmaking style, and I love having certain burdens lifted off my shoulders by dividing the labor up. Above all, I love working with actors and observing them and then reworking scenes with them until they feel right to us. What’s next for Winter/Spring, and you? Where do you see the project going in the future? Hopefully we keep sending it out to those beloved festivals to be seen. I’ve said too much as it is. Bryan, thank you infinitely. As I mentioned, this was one of my favorite interviews for so many reasons. Readers, I’d love to hear your thoughts. Does anything we’ve said strike a chord?